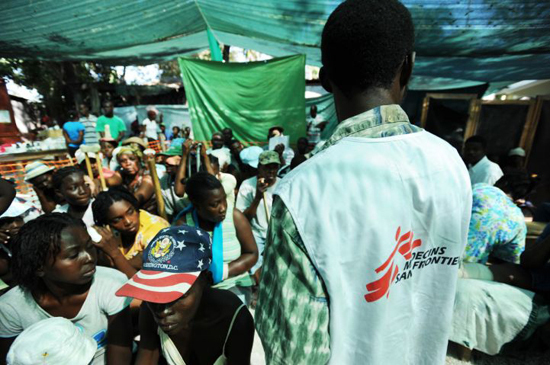 MSF had already been present and active in Haiti for the past 19 years. It was therefore ready to respond when the disaster struck. And it is now prepared to do the work that will remain in the days, months, and years to come. Before the catastrophe, 70 to 80 percent of Haitians could not afford health care. More than 70 percent of them were reported to be living on less than US$2 per day. Haiti’s health-care system before the earthquake did not address the basic medical needs of the population in Port-au-Prince. Health-care services are structured in three levels: a first level with over 600 health centers with and without beds and 45 community hospitals; a second level consisting of 10 departmental hospitals; and a third level made up of six university hospitals, five of them in Port-au-Prince. These health-care structures are provided or supported by a multitude of actors from the public sector, the private for-profit sector, and the mixed and private non-profit sector. Although annual governmental expenditures on health per capita is more than US$60, and although a multitude of international, bilateral, and nongovernmental organizations are directly involved in supporting health-care provision and prevention, close to three quarters of the population still has insufficient or almost no access to health care services because they cannot afford the user fees applied in private for-profit, public, and private not-for profit health care services. The effects of the earthquake on this already deficient health-care system were devastating. In the affected regions, more than 60 percent of the medical facilities were either severely damaged or totally destroyed. The main offices of the Ministry of Health and much of its material resources were also completely wiped out. In the 12 months that have passed since the disaster, major gaps in health care provision remain throughout the capital. 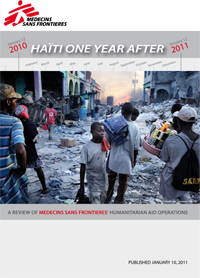 MSF’s operational budget projections for Haiti for 2011 are €46 million ($60.7 million) to maintain a network of 6 private hospitals with a total capacity of up to 1,000 beds in Port-au-Prince and to continue its support of two Ministry of Health hospitals. Outside the capital, MSF continues to run its 120-bed private container hospital in Léogâne, focusing on secondary level care with trauma, pediatric, obstetric, maternal, orthopedic, and burn treatment services. Additionally, MSF is working to establish a foundation that would create a public-private hospital in the capital in the years ahead. Another €7.5 million ($9.9 million) is projected to be required to continue cholera-related activities in Haiti in 2011. Beyond these projected activities, MSF will remain ready to respond to new emergencies in the country—as it does in all of the nearly 70 countries it operates in today. MSF had already been present and active in the country for the past 19 years. It was therefore ready to respond when the disaster struck. And it is now prepared to do the work that will remain in the days, months, and years to come. Land is being purchased for the construction of a new hospital in the Industrial area of Tabarre. It will have 110-bed capacity and will act as a referral structure for emergency cases in the Cité Soleil and Martissant slums, providing pediatric, orthopedic, rehabilitation, and mental healthcare services as well. The current medical facilities in Martissant, Choscal, and Bicentenaire are to provide treatment, stabilization, and transfer of emergency cases. The MSF container hospital in Léogâne will continue its focus on obstetric, trauma, and pediatric emergencies. As other NGOs move in with primary health care activities, the hospital’s outpatient department will close down or concentrate on specialized consultations. The goal is to find a solid partner who can take over the hospital in due time. By January 2011, the inflatable hospital at Saint-Louis will be deflated, and the medical program—rebuilt with containers—can move to a more permanent structure of 120 beds in Drouillard. MSF will turn over full responsibility for the Jacmel hospital to the Ministry of Health in January 2011. Bicentenaire Hospital, an 80-bed facility in a stone structure, will continue its activities with a focus on emergency and pediatric care until at least the end of 2011. Emergency obstetrics and neonatal care will restart in the newly constructed container hospital in Delmas 33 that replaced the collapsed Hôpital Maternité Solidarité. This 135-bed maternity hospital now meets earthquake and hurricane resistance standards. The new facility will provide access 24/7 to free and high-quality emergency obstetric care for complicated pregnancies and deliveries. MSF will provide access to prenatal consultations and follow-ups to patients with problems related to pregnancy, such as eclampsia, pre-eclampsia, pregnancy-related hypertension, and pre-existing hypertension. There will be post-natal consultations and follow-ups for patients who delivered in the maternity hospital. MSF will offer voluntary counseling and testing for HIV to all women admitted to the Delmas 33 Hospital on the basis of their serologic and immune status, while establishing a referral system for those who test positive. All newborns who are ill and/or born premature at the Delmas 33 Hospital will receive neonatal care. MSF will hire more than 155 Haitian staff to run the hospital and extend training opportunities for medical residents from in Port-au-Prince. MSF is also working on a new proposal for a general hospital with a capacity of 212 beds, a training program for medical students and specialist doctors, and a long-term transition plan. With this in mind, MSF has set up a foundation which will involve partners from Haitian civil society, universities, and other sponsors. Medical specialties will include orthopedics, general surgery, burn care, management of chronic pathologies in the acute phase—asthma, diabetes and hypertension, in particular—and functional rehabilitation. Most of the staff working in the hospital will be recruited in Haiti according to the skills and qualities necessary for the proper functioning of medical activities. The management steering committee will be gradually appointed from staff recruited at the beginning of the project. To do this, they will receive appropriate training supported by MSF in collaboration with other partners. MSF will guide and financially support the start-up phase of this stand-alone Haitian foundation with the aim of leaving it to local management once it is sustainable. Following the January 2010 earthquake, the response by various actors often (and understandably) focused on primary rather than secondary health care. However, trauma injuries are one of the major causes of morbidity and mortality in Haiti. Surgery capabilities are needed, as are permanent structures in which to carry them out. MSF thus decided to create a container hospital that would bridge the gap between the emergency response and the longer-term response and would provide a variety of essential surgery services in a site that could be used by the city. In second half of 2011, MSF will open a 110-bed container hospital in Tabarre, Port-au-Prince, with the aim of turning it into a trauma surgical center able to carry out 150 surgeries a month. Traumatology, orthopedic, and visceral surgery will be provided, along with emergency pediatric surgery and patient rehabilitation. MSF wishes to acknowledge the suffering of the Haitian people, who have endured so much during and after the earthquake. However, much of the affected Haitian population continues to live in very precarious circumstances. With the continued support of our donors and staff, MSF remains committed to addressing the needs in Haiti to the best of our ability in the coming years. The earthquake in Haiti was an unprecedented disaster for the Haitian people and created enormous medical and non-medical needs. The aid response has been unable to fully meet these needs; throughout the year the assistance provided, whether for shelter, clean drinking water or cholera treatment, was not enough. There is much about the international aid system that can be improved, and MSF also recognizes that there are areas in which we ourselves can improve in terms of deploying our own resources, especially regarding shelter and preparing for mass casualties, as well as in voicing our concerns and engaging with others to improve the aid response. With the ongoing generous support of our donors and commitment of our staff, MSF is dedicated to using our experience in Haiti to prepare our actions in future emergencies. Over the past year, MSF attempted to meet the most critical medical needs in Haiti. As in every context, we had to make choices on how we could best employ our expertise and resources, keeping in mind other critical needs and emergencies elsewhere in the world in 2010. In the first phase, this was through trauma surgery and other emergency medical activities, along with shelter and water and sanitation activities. In the second phase, this was through post-operative, mental health, and primary and secondary health care services. When cholera broke out in October, we reoriented our activities to respond as robustly as possible to treat those affected, while keeping up our other programs as well. In 2011, we will focus on running six hospitals and supporting two Ministry of Health hospitals. Unfortunately, more than one million people remain homeless in Haiti today. The shelter and water and sanitation services still do not meet the needs of the people and continue to create the conditions for future outbreaks of disease. Cholera is now expected to remain in the country for years to come. MSF will continue its response to cholera and stay vigilant in the face of other emergencies that unfold in the year ahead.